The current government intentionally kept hareidim out just because of their 'beards and sidelocks,' said MK Ya'akov Litzman. MK Ya'akov Litzman (UTJ) on Sunday submitted a private Knesset Member's bill that would expand the laws on racism to include the “ostracizing” of hareidim. Such laws exist today for other groups, and Litzman's proposal would expand the law to include hareidi Jews. The penalty for violating the law could be as much as ten years in prison. In addition, if the offender achieved a material benefit as a result of their actions, that benefit could be taken away. In an explanatory note, Litzman said that the formation of the current government was carried out specifically to exclude hareidi parties, and thus excluded a significant portion of the country's population from representation in the government. Many hurtful things were said and done during and after the election, he wrote, and many of those wounds are still open. It was on this basis that the current government was formed, and the new law, Litzman wrote, would prevent exclusion on the basis of group, ethnic, or religious membership or affiliation in future governments. 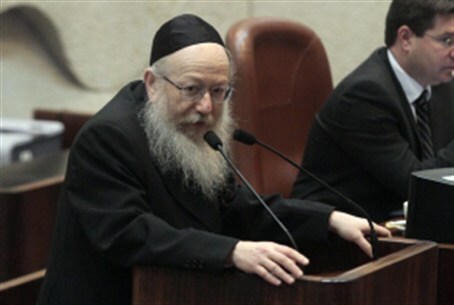 Litzman said that the law was not aimed at guaranteeing a place for hareidim in every government. Negotiations can bring about specific decisions that may or may not enable parties such as UTJ or Shas to join a government. “With that, the ostracizing in advance of a whole group, only because they are hareidi, dressed in beards and sidelocks – as occurred in the formation of this government – is a serious phenomenon that we as a society cannot accept. The best way to prevent a repeat of this is through legislation,” he wrote.